Anita has been one of the most successful female bridge players of the last few years, winning a number of domestic competitions - the 2018 Gold Cup, 2017 Crockfords Cup, 2014 Schapiro Spring Foursomes, 2013/14 NICKO, and the teams event at the 2015 Easter Festival in London - and taking the gold medal in the Mixed Teams at the 2014 World Bridge Series in Sanya, China. In 2017 she was part of a team which won a bronze medal in the Transnational competition at the World Teams Championships. 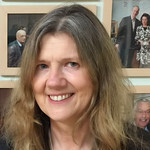 She worked as a video game developer with her company, Magnetic Scrolls, being a pioneer of the text adventure games genre and one of the two largest and most acclaimed interactive fiction developers of the 1980s. An interview with her on the subject is here.